We here at Titus Contracting love helping our clients create the perfect new kitchen for their homes. As a kitchen renovation company serving Eagan, we have helped many of your friends and neighbors get the kitchen of their dreams. We’re going to cover a few of the most popular kitchen styles, and we will hopefully inspire you as you are planning your kitchen renovation! Kitchen remodeling projects are rated at the top for things you can do that add long-term value to your home. Learn which type of kitchen design will best complement your style of living. Farmhouse kitchens are incredibly popular. Think about how a warm and homey kitchen can meet functional and practical design ideas, like an eat-in area. They use open shelving, apron front sinks (otherwise known as farmhouse sinks) and classic flooring, and they will sometimes feature a big kitchen table. Great for big families or families who entertain quite often, this is a classic kitchen design style. If this is what you have in mind for your kitchen renovation, we can definitely help! Modern kitchens are sleek and minimalist. The hardware on the cabinetry is generally sleek and simple, and these types of kitchens do not usually have a ton of decorations and knickknacks laying around. This type of kitchen renovation is great for those who prefer a kitchen that is beautiful but uncomplicated. Traditional kitchens are usually the most popular type of kitchen renovation we do. This is probably what you picture when you think of a kitchen. It is warm, welcoming and is a classic style for anyone’s kitchen renovation project. Not to be confused with modern, although they are quite similar. Contemporary kitchens are as sleek as a modern kitchen, but these kitchens incorporate some more playful elements. They are usually pretty unique and a great reflection of the homeowner’s personality. This type of kitchen renovation is great for families of all sizes! Take a look at the fantastic results of our Nakomis kitchen design and completed remodel. Or this kitchen renovation in Minneapolis. If you love traditional kitchens and contemporary kitchens, you should consider the transitional kitchen design style for your kitchen renovation. They incorporate the warmth of a traditional kitchen with the simple and clean lines of a contemporary kitchen. If your tastes go more European than American, you can get the look and feel of a Parisian bistro with this type of kitchen renovation. Go for warm kitchen lighting, get tile floors put in, hang up some pretty cookware, use colors like blue and yellow for your walls and accents. We’ll also help you make a well-informed choice for the best kitchen counter-top material to use. Watch and learn from the full video by Scott Rajavuori on How to add color when designing your kitchen. * Add color when finishing your kitchen cabinets. Often we use a mix of enamel and stain. For example: try two complimenting enamels like grey and green where perhaps an island is a different color or uppers are different. Sometimes we will accent one specific area like a buffet or bar area within the cabinets. Sometimes we will use a light enamel, like white, with all the perimeter cabinets than bring focus to the island with a deep rich stain. We’ll also consider what blends well with your kitchen appliances. * Add color in your choice of kitchen countertop material. There are so many options in countertops. There are some bright and wild colors available. Tops with incredible graining or swirled colors formed naturally or through quartz products. Again, you can have an island in one color and the perimeter tops in another color to create some distinction and separation. * Choice of color on the walls and trim. Usually, we will alter dark and light tones of paint color to a kitchen. If the cabinets are a deep rich color we will use lighter warm colors to have the cabinets pop. If the walls are darker in paint color the cabinets off are light so they jump out again. An accent color is nice when used properly. This is a specific wall you want to draw attention to so you paint it a color that compliments but contrasts the main wall paint color. Our design team can help you plan your kitchen renovation. 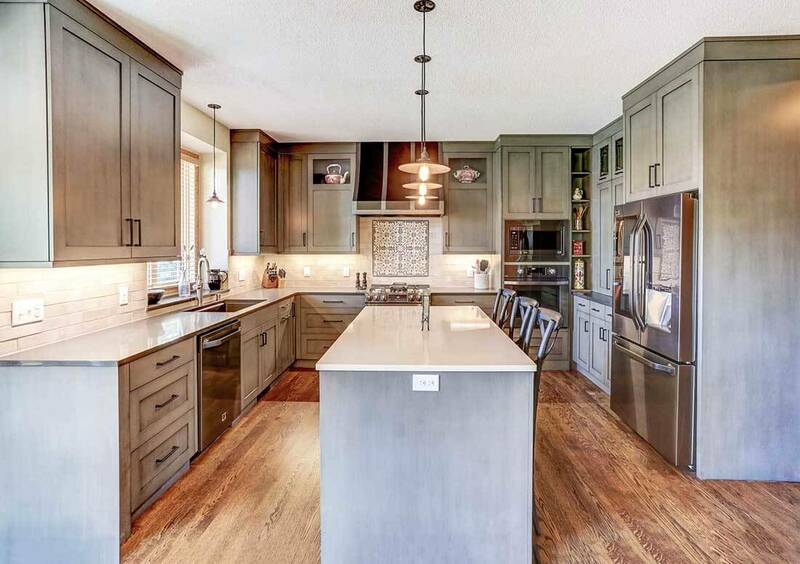 Are you interested in learning about how to hire Titus Contracting for your kitchen renovation in Eagan?